"Lace-Up Deux" are crocheted fingerless flirt gloves worked in red colour acrylic yarn. It is made up of two parts, the upper and lower parts which are then laced together at the two sides with black elastic strings. 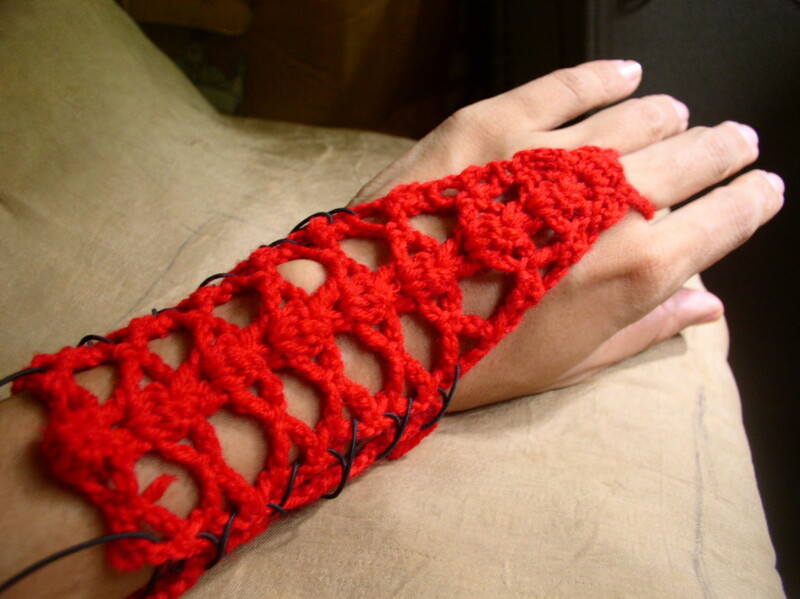 Red flat-back sew-on beads decorate the gloves. 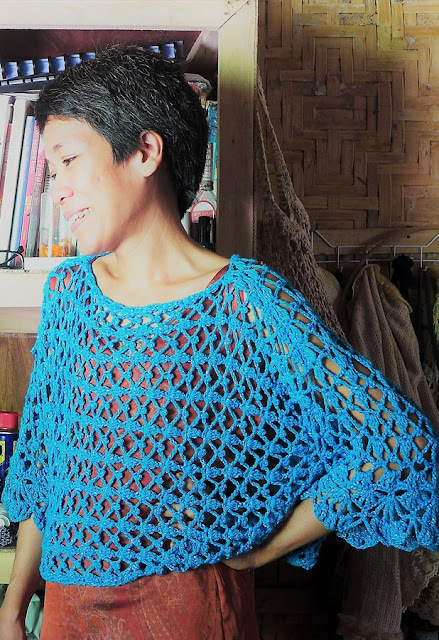 The free pattern includes both written and symbol instructions. 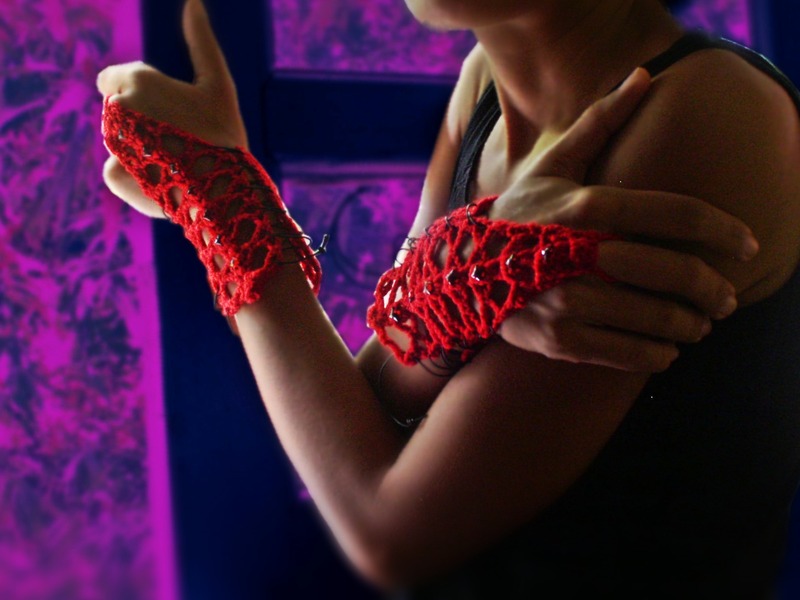 You can find the single-laced gloves at "Lace-Up!" Note: The top and bottom sections of the glove are made separately and are laced up together at the sides with black elastic string. Row 1: Ch 6 (counts as 1 dc, ch 3), sc in 9th ch from hook, ch 3, skip 2 ch, *Yo, insert hook in next ch and pull loop through, yo and and pull through 2 loops on hook, rep from * 3 more times, yo and pull through all 5 loops on hook (bobble made); ch 3, sk 2 ch, sc in next ch, ch 3, sk 2 ch, dc in last ch, ch 3, turn. Row 2: Dc in first dc, ch 5, [dc, ch 1, dc] in top of bobble, ch 5, 2 dc in turning ch, ch 6, turn. Row 3: Sc in 5-ch sp, ch 3, bobble in ch-1 sp, ch 3, sc in ch-5 sp, ch 3, dc in turning ch, ch 3, turn. Rows 4-11: Rep rows 2-3 four more times. Row 13: (Decreasing row) Sc in ch-5 sp, ch 3, bobble in ch 1 sp, ch 3, sc in ch-5 sp, ch 3, sc in turning ch, ch 3, turn. Row 14: Sk ch 3, dc in next sc, ch 3, [dc, ch 1, dc] in top of bobble, ch 3, dc in next sc, sk 2 ch, dc in last ch, ch 3, turn. Row 15: Sc in ch-3 sp, ch 3, bobble in ch-2 sp, ch 3, sc in ch-3 sp, ch 3, sc in turning ch, ch 3, turn. Row 16: Sk 3 ch, sc in next ch-3 sp, ch 3, [dc, ch 1, dc] in top of bobble, ch 3, sc in next ch-3 sp, ch 3, sc in last ch-3 sp, ch 3, turn. Row 17: Sk ch-3 sp, sc in next ch-3 sp, bobble in ch-2 sp, ch 3, sc in next ch-3 sp, ch 3, sc in last ch-3 sp, turn. Row 18: (Loop for middle finger) Ch 16 (check if it fits), sc in last ch-3 sp. Fasten off. Row 1: Ch 3 (counts as 1 dc), dc in 4th ch from hook, *ch 2, sk 2 ch, dc in next ch, rep from * 4 times, dc in last ch, ch 3, turn. Row 2: Dc in next dc, ch 2, sk 2 ch, dc in dc, ch 2, sk 2 ch, dc in next dc, 2 dc in ch-2 sp, dc in dc, ch 2, sk 2 ch, dc in next dc, ch 2, sk 2 ch, dc in dc, dc in turning ch, ch 3, turn. Row 3: *Dc in next dc, ch 2, sk 2 ch, dc in next dc, 2 dc in ch-2 sp, rep from * dc in next dc, ch 2, sk ch-2 sp, dc in next dc, dc in turning ch, ch 3, turn. Row 4: Dc in next dc, 2 dc in ch-2 sp, dc in next dc, ch 5, dc in ch-2 sp, ch 5, sk 3 dc, dc in next dc, 2 dc in ch-2 sp, dc in next dc, dc in turning ch, ch 3, turn. Row 5: Dc in next dc, ch 6, sc in ch-5 sp, sk dc, sc in next ch-5 sp, ch 6, sk 3 dc, dc in next dc, dc in turning ch, ch 3, turn. Row 6: Dc in next dc, 3 dc in ch-6 sp, ch 5, dc between 2 scs, ch 5, 3 dc in ch-6 sp, dc in next dc, dc in turning ch, ch 3, turn. Row 7: Dc in next dc, ch 2, sk 2 dc, dc in next dc, 3 dc in ch-5 sp, ch 2, 3 dc in next ch-5 sp, dc in next dc, ch 2, sk 2 dc, dc in next dc, dc in turning ch, ch 3, turn. Row 8: Dc in next dc, ch 2, sk 2 ch, dc in next dc, ch 2, sk 2 dc, dc in next dc, 2 dc in ch-2 sp, dc in next dc, ch 2, sk 2 dc, dc in next dc, ch 2, sk 2 ch, dc in next dc, dc in turning ch, ch 3, turn. Row 9: *Dc in next dc, ch 2, sk 2 ch, dc in next dc, rep from * 4 times, dc in turning ch, ch 3, turn. Row 10: Dc in next dc, ch 2, sk 2 ch, dc in next dc, 2 dc in ch-2 sp, dc in next dc, ch 2, sk 2 ch, dc in next dc, 2 dc in ch-2 sp, dc in next dc, ch 2, sk 2 ch, dc in next dc, dc in turning ch, ch 3, turn. Row 11: Dc in ch-2 sp, ch 1, dc in same sp, ch 3, sk 3 dc, sc in next dc, 2 sc in ch-2 sp, sc in next dc, ch 3, dc in next ch-2 sp, ch 1, dc in same sp, ch 3, sc in turning ch. Fasten off. 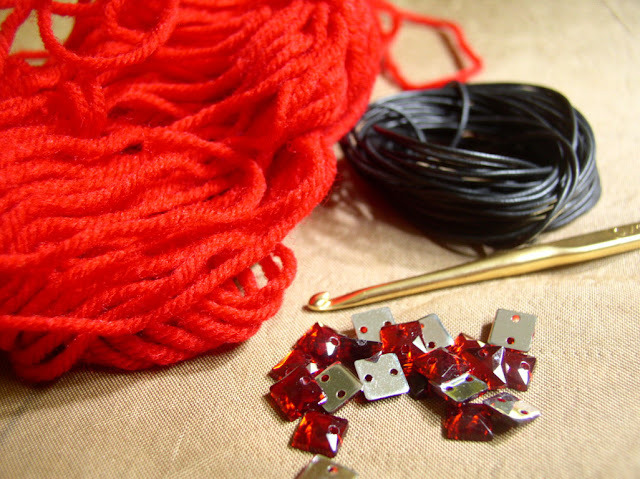 Embellishing and lacing up: Block the four pieces first. Then sew the beads on the bobbles across the top of the gloves. Do this before you lace them up. 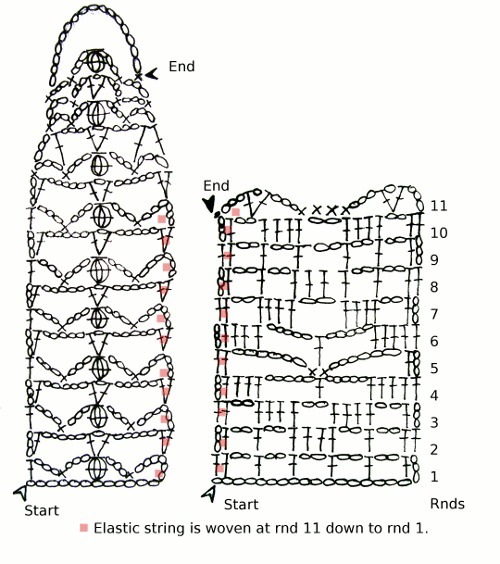 The crisscross method of lacing is used in the model – the laces simply crisscross as they work their way down the glove. 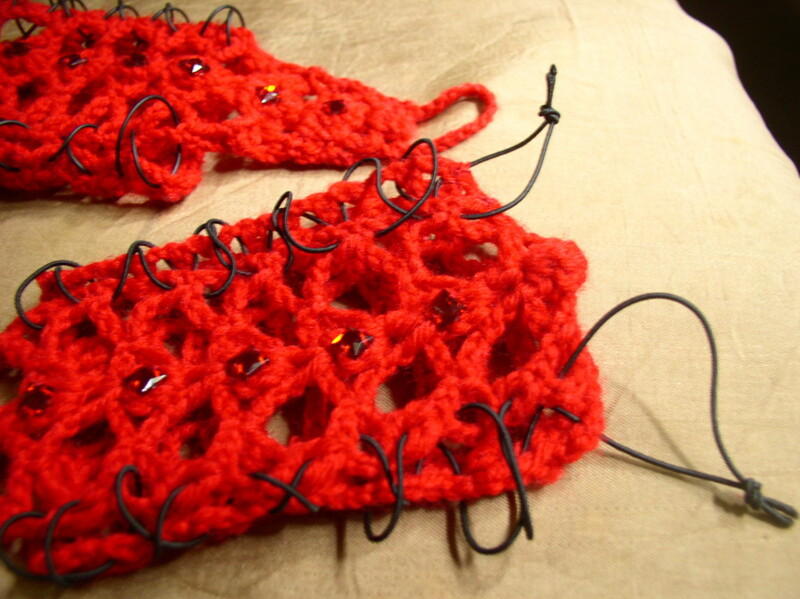 Lacing starts at row 11 of both top and bottom sections of the glove. Slip the laces in the chain spaces and between the two dc's. When you reach the end of the glove, knot the ends of the laces together.